This is the hardware page. here you can find general directions about the right Control method. Probably the most popular pedal to control a looper that receives MIDI is the Behringer FCB-1010. It is robust and cheap and once programmed, it works for a long time. However, it is bulky and there have been no updates in years. More sophisticated and more creative (in the sense that we can talk to the person that creates them) is the Gordius Little Giant. This was developed by the same team that created the Uno chip which expands the features of the FCB1010. Here’s a new midi foot pedal from MeloAudio. 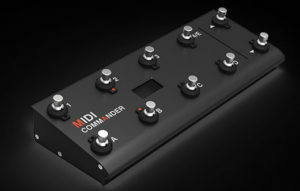 Compact, solidly built, with 10 banks of 8 commands midi out and sockets for 2 expression pedals. There doesn’t seem to be a software editor. The Nektar Pacer is a new product that looks very powerful, but sadly, it has no editing software, a deal-breaker for many users. Very interesting for its size and features is the Keith McMillen SoftStep and 12 Step. there are more suitable pedals and loads of hand controllers. please contribute your experiences! Be careful not to buy a pedal that only sends Program Change! those do not send a button release signal and thus are very limited! Kim Flint wrote a Footpedal Tutorial for the Echoplex which contains interesting information valid for other units, too.